Many nuclear power plants rely heavily on access to nearby sources of cold water to keep the system cool. Many of these power plants were built several decades ago and some of them are not well prepared for the warmer weather we are now experiencing. At a twin-unit nuclear power plant in Illinois, temperatures exceeded what is allowed with current regulations by four degrees Fahrenheit. The cooling pond consists of a 2,500-acre (10 square kilometer) lake. For a cooling system like this to function properly, the heat dumped into the pond eventually has to move somewhere else. The warmer the weather the more saturated the air becomes, which means less energy is transferred away from the cooling pond. In a typical situation, cooling ponds loose their heat during the night, but because the temperatures these days have stayed above 90 degrees, the plant`s cooling system has been compromised. The permitted level that originally was 98 degrees has now been increased to 100 degrees in order keep the power plant up and running. The safety argument “is likely solid and justified,’’ stated David Lochbaum of the Union of Concerned Scientists, but “it is tough to argue (rationally) that warming water conditions are unforeseen.’’ That is a predictable consequence of global warming, he said. 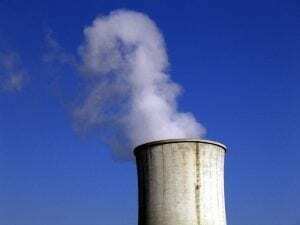 Drought and water shortages, also caused by the change in weather, could potentially become a problem for nuclear power plants in the near future as well. A nuclear power plant`s cooling could become less efficient by water-shortages in much the same it does with increasing temperatures. Georgia, Alabama and similar states have to be extra careful with this in the coming years. Energy Engineer Mathias Maehlum regularly writes about wind, solar, geothermal and other sources of energy at Energy Informative.